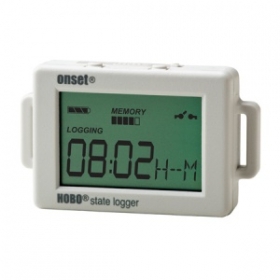 The HOBO UX90-001 State / Pulse / Event / Runtime data logger records state changes,electronic pulses and mechanical or electrical contact closures from external sensing devices. This logger is ideal for monitoring energy consumption, mechanical equipment operation, and water and gas flow. The HOBO UX90-001 State Logger is available in a standard 128 KB memory model (UX90-001) capable of 84,650 measurements and an expanded 512KB memory version (UX90-001M) capable of over 346,795 measurements.